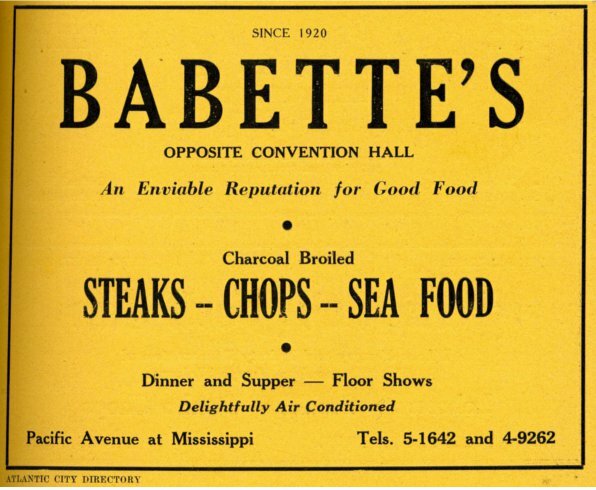 Famous for its charcoal grilled stakes, seafood dinners, live entertainment and illegal backroom gambling, Babette's was a staple of Atlantic City nightlife throughout the 1920s. Located at 2211 Pacific Avenue – property now occupied by the Trump Plaza Casino – Babette's was owned by Dan Stebbins and was originally called the Golden Inn. In 1920, a young singer and entertainer named Blanche Babette came to Atlantic City, where she met and married Dan Stebbins who owned a small club on Pacific Avenue known as the Golden Inn. The pair expanded the facility and renamed it Babette's in the 1930s. While Dan Stebbins managed the business side of the nightclub, Blanche handled the revues: designing costumes, arranging the music, rehearsing the chorus line, and introducing the acts. Stars like Eleanor Powell, Jack White, Joe Penner, the Carlisle Sisters, comic Little Jerry Bergen, and Velma and Buddy Ebsen performed there. Visitors included Jimmy Walker, Mayor of New York; Rudy Vallee; the Three Stooges and Milton Berle. The décor of Babette's was famously unique. It was fashioned in a nautical theme which included a bar in the shape of a ship. It is rumored that a trapdoor that led from the horse room – an illegal backroom gambling center where individuals placed bets on horse races – to the roof of the building, from which one could then access the Stebbins' home. During a federal investigation in the 1930s, Babette's was targeted for its gambling and horse-race betting operations. In 1943, Sheriff James Carmack led a raid on Babette's. Racing sheets, craps tables, roulette wheels and telephones were seized. Stebbins ultimately paid $5,000.00 in fines. In 1950, the Stebbins retired from the business and sold the nightclub. Dan Stebbins passed away in 1960 and Blanche in 1963. An ad for Babette's in the 1946 Atlantic City City Directory. (H009.BabettesAd1946CityDirectory. Atlantic City Heritage Collections, Atlantic City Free Public Library. Local History Biography File – "Stebbins, Blanche Babette"
Local History Subject File – "Nightclubs"